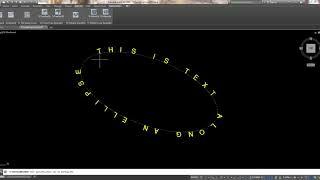 This app will read the contents of a user selected MText object and interactively place individual characters along a user selected curved object. Supported objects are Lines, Polylines, Fitted Polylines, Splines, Arcs, Circles, Ellipses, Elliptical Arcs and Polygons. User can fine tune the end result by dynamically adjusting the text size, character spacing, character alignment and flipping the text direction. The end result is a curved text whereby the individual characters are combined into a single anonymous group.